Separating uranium is a big deal because U-235 is fissile and U-238 is not. The original motivation to separate uranium was to make a bomb during the Manhattan Project. The first nuclear bomb ever used in war, 65 years ago today, was based on separated uranium-235. And enrichment has had a bad rap ever since. But fortunately, that’s not how it works. Fluorine has only one natural isotope, number 19. So when you go add six fluorines to uranium, you know that they’re all going to be 19. Any difference in mass from the molecule all comes from the uranium, not the fluorine. So we’ll do a little math. If you have a uranium atom that has a mass of 235, and you go and add six other atoms each with a mass of 19 to it, what do you get? (235 + 6*19) = 349. (I won’t lie, I used my calculator) And if you have a uranium atom with a mass of 238? (238 + 6*19) = 352. Nice teasing introduction to the subject Kirk. Stay tuned for revelations on the life and habits of the mysterious SWU. You slipped a digit on your atom counts there. U-235 is 0.72% of natural uranium, which is 72 atoms in every 10,000 (not 1000) and U-238 is 9,927(+) in 10,000. I feel like a complete idiot for asking this, but what does SWU stand for? You were warned – I did say it was nonlinear. Because V -> infinity as x -> 0 and also as x -> 1, it's rather difficult to obtain isotopically pure samples of a given isotope by thermal or mass-based separation. All good if you are going to exploit mass differences by gaseous diffusion or centrifuges. Different story for laser-based processes. A scientist at a national lab once said to me "God intended us to enrich UF6". For a long while I hadn't made the connection that not only is it gaseous, but the single stable isotope of fluorine is also very important. The only downside is that UF6 isn't the easiest thing in the world to work with. But no pain no gain, right? "Because V -> infinity as x -> 0 and also as x -> 1, it’s rather difficult to obtain isotopically pure samples of a given isotope by thermal or mass-based separation." Also, this gives the value function a minimum at middle enrichments, meaning enriching from 0.72% up to 5% or 20% takes care of a lot of the necessary work to make it up to 80% or 90%. Hence some of the concern vis-a-vis the photo at the top of this page. It was the issue of SWU which proved that Michael Dittmar's series on The Oil Drum last year was a pack of lies (I use the term deliberately). Dittmar never mentions separation, as if it was toxic. When it was brought up to him repeatedly in the comments, he danced around the issue without ever addressing it. The editors repeatedly censored the commenters who pointed out where Dittmar was deliberately avoiding the facts which contradicted his claims. Dittmar also avoided any mention of thorium. In other words, there is a conspiracy in prominent circles to avoid the facts because they contradict the narrative the doomers have constructed for public consumption ("there is no hope, power down"). The doomers may be correct that nuclear power may be taken down by a general collapse following a fossil-fuel crisis and leave us with a very dangerous legacy, but the public would not go along with power-down and would instead demand that nuclear power be expanded rapidly to avoid the crisis at the outset. JD: "The only downside is that UF6 isn’t the easiest thing in the world to work with. But no pain no gain, right?" Fluorine wasn't isolated until the late 19th century. Isaac Asimov wrote an essay on the history of the effort, called "Death in the Laboratory" about the series of chemists who died in the process. It wasn't until the Manhattan Project that chemical engineers developed the techniques for using fluorine gas on the industrial scale. Arcs-n-Sparks is right about laser enrichement. Once that genie is out of the bottle enrichment gets faster and cheaper. Those who worry about proliferation of fission bombs worry a lot about laser enrichment. I hate to be pedantic, but I can't stand the fission diagram above. "Huge energy" is not separate from fission products and neutrons; the resultant energy from fission is due to the velocity of those particles: it's kinetic, and is quickly transformed into heat by velocity transfer via electromagnetics (after all, heat is average kinetic energy, and kinetic energy is just mass in motion). 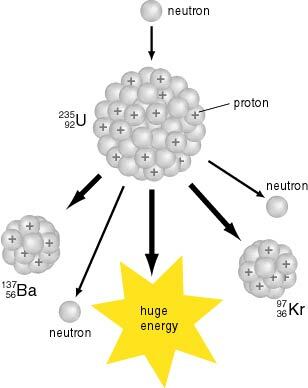 The diagram should have labels on the arrows describing either the energy of the fission results, or their velocities (~700 keV / amu, or ~8,200 km/s for the fission products, and ~2MeV / amu [~14,000 km/s] for the neutrons). Only a relatively small amount of energy (2.2% yield) is released as gammas (and it's mostly decay products of the fission products). I seriously didn't understand nuclear energy until I grasped this basic fact – that the energy of a nuclear reaction is carried in the velocities of its shrapnel. That diagram always caused it to go wrong: if it's some kind of separate "energy", it's mysterious. If it's energy we all know and love – kinetic energy – it becomes quickly real and tangible. 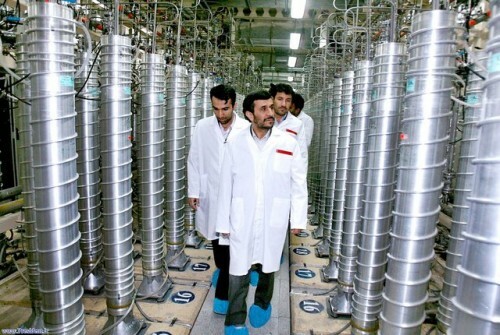 "All good if you are going to exploit mass differences by gaseous diffusion or centrifuges. Different story for laser-based processes." SILEX is a neat technology. 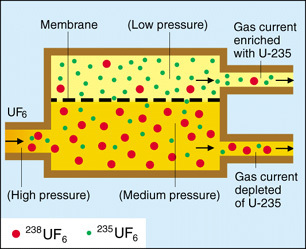 Basically it exploits the differences in resonation between U-235 and U-238, and excites the former more strongly than the latter, which boosts the overall efficacy and enrichment ceiling of Kirk's above-mentioned membrane-based process. The problem is that the CO? lasers needed to get the right frequency are of very low efficiency (on the order of a percent or two). This keeps them from obtaining an economical energy / SWU value up until the weapons-grade enrichment zone. That said, SILEX can be easily adapted to obtain isotopically pure separations of almost any element, not just uranium. Just modify the frequency to match the isotope you mean to isolate. Laser efficiency is always improving. AVLIS was using copper vapor pumped dye lasers with pretty good efficiency relative to gaseous diffusion. Very small footprint and signatures, which will make detection difficult. You actually care about the nuclei in a chemical context rather surprisingly often. One reason you care is that there are natural processes that ever so slightly favour one isotope over the other, allowing you to use it as a proxy measurement. E.g. carbon isotope ratios tell you something about the source of the the carbon in atmospheric CO2(photosynthesis slightly prefers carbon-12, non-plant sources of CO2 like volcanoes do not); oxygen isotope ratios in trapped gas tells you something about ancient climates. Another is that you want to see where some chemical goes and at what rate when you introduce it into a system. e.g. you might want to see how fast a cell does translation of RNA into proteins or you might want to see where trace amounts of a chemical goes when a person eats it, or you might know that cancer really likes to absorb some compound and hence be able to pinpoint the cancer with a radioactive tracer. "If fluorine itself had a number of different isotopes then this whole idea wouldn’t work." If there are two isotopes of fluorine with a significant natural abundance, enrich fluorine gas. The reason this works is at least 25% of molecules either have 2 heavy fluorines or two light fluorines(depending on which type of fluorine was more abundant). If there were many isotopes of fluorine with a natural abundance high enough to be significant, you'd need a gaseous compound of fluorine that contains only one fluorine and where the other atoms are of some specific isotope. The easiest I can think of would be to make hydrogen fluoride. Deuterium is fairly scarce(one in a thousand or so I believe), so enrichment of hydrogen is probably not required. Since you get some enrichment of hydrogen for free(the rejected fraction in heavy-water production) you might want to take that anyway.